Metro Meteor is a diva—a 14-year-old thoroughbred horse with a storied history and a nippy personality to boot. He’s made appearances on “Good Morning America,” “The Today Show,” O, The Oprah Magazine, The New York Times, and countless other national and local outlets. Metro isn’t your average horse—not by a long shot. He once competed at famed tracks such as Belmont and Saratoga, earning nearly $300,000 in winnings. That’d make for quite the story, but it wasn’t the reason he earned segments in national media outlets. His race shoes had long been hung up—Metro last competed in 2009. Metro’s tale easily could end right there: a famed horse with a winning pedigree living his remaining days in the loving care of Ron and Wendy Krajewski. But, Metro’s tale has a number of layers. At the home of the Krajewskis, Ron glances from the dining room table, where he shares details of Metro’s famed past, to a painting on the wall. The abstract creation—filled with brilliant, bright colors—is just one created by Metro that hangs in the couple’s home. You could call it a new lease on life for the famed horse who once was given just two years to live in 2013 due to debilitating bone growth in his knees—an ailment that ended his racing career. But, Metro didn’t die. 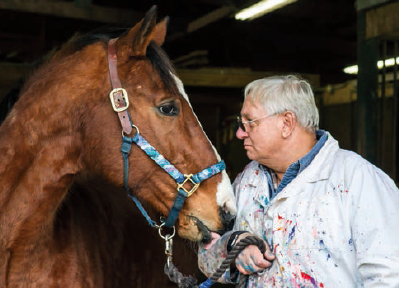 He found new life with an experimental treatment that extended a dim outlook on his life and a newly found passion to paint. Yes, Metro is an artist—a world famous artist who has garnered international attention. Metro’s injured knees limited his ability to ride and freedom to roam in the pasture. But, Ron noticed that Metro loved to bob his head. An artist himself, Ron saw potential in Metro. 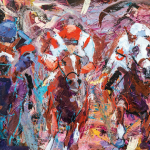 He gave Metro a paintbrush, added a canvas, and the ex-racer went to work—bobbing his head and splattering paint to canvas in majestic strokes. The pair has become quite the duo. Ron’s artistic eye guides the palette choices while Metro provides the strokes and splatters. Metro’s art soon graced the walls of Gallery 30 in Gettysburg. It sold—quickly. As Metro’s fame as a painter grew, the condition of his knees improved. It was the day that “The Today Show” came to film Metro that the Krajewskis first noticed an improvement in his condition. “But we couldn’t say anything because the camera was rolling, but inside we were just jumping up and down,” Wendy adds. “We knew then that the treatment was working.” Metro’s painting has continued to be a big hit among art aficionados ever since. 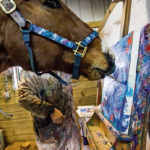 Money raised from his works supports his knee treatments and half the proceeds are donated to New Vocations Racehorse Adoption Program. To date, they’ve donated more than $80,000. “He’s actually saved horses that they normally wouldn’t have saved,” Wendy says. “He’s made an impact on so many,” including Ron and Wendy. Visit www.paintedbymetro.com to see Metro on “The Today Show,” NPR, and more.